So you got your new iPhone and paid a tremendous amount of money. That’s OK since it is indeed an amazing device. However, you don’t know how to put your old backup on new iPhone (iPhone X or iPhone 8 included), especially when the new iPhone is running the latest iOS 12? Here the article tells how to put backup on new iPhone with 3 different methods. All 3 are great, work for various iOS versions, and you may use the one of the methods to ease your stress & frustration. Go on and find what can help. Back up and restore contacts or messaging apps like WhatsApp, text Messages, WeChat separately. If you need, you can restore only WhatsApp messages to new iPhone. Selectively put data from different iTunes/iCloud backups on the new iPhone, including iPhone X or iPhone 8 running iOS 12 and older versions. Make new backups for iPhone that will not overwrite previous backups (another feature that iTunes is lacking), and the backup feature is totally for FREE. You will know how to put backup files on new iPhone without any data loss on the target device. 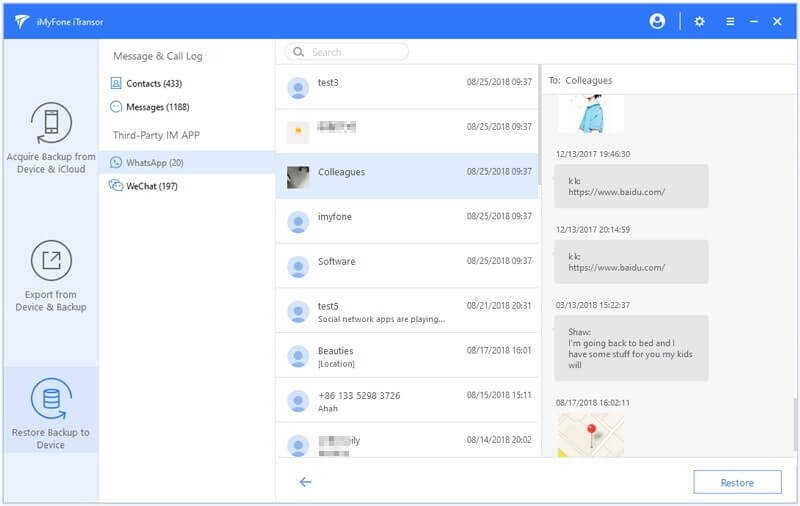 These reasons are why the iTransor should be one of your number 1 choices for backing up and managing your backup files. 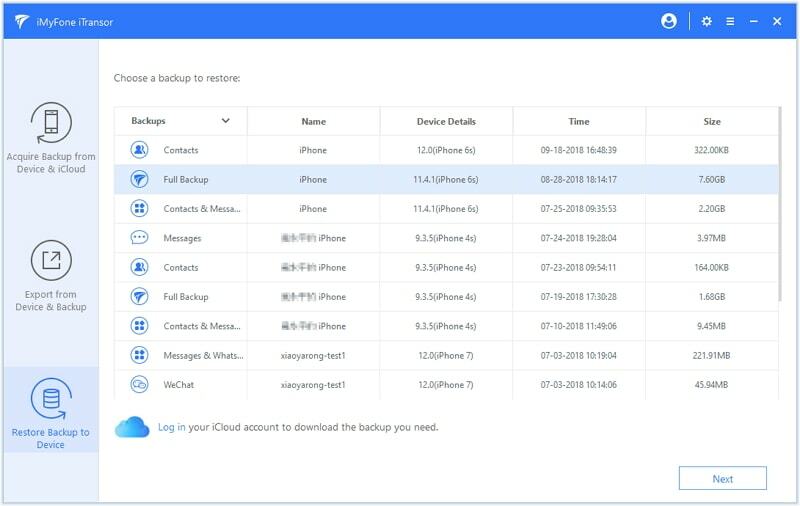 The following is how to put backup on new iPhone from computer via iMyFone iTransor in a glance. (1) Simply connect your iPhone to a PC/Mac and run iMyFone iTransor. Click Restore Backup to Device and you will see all the iTunes backups on your computer. Pick one and click Next to continue. (2) Decide if you want to restore a partial or full backup. 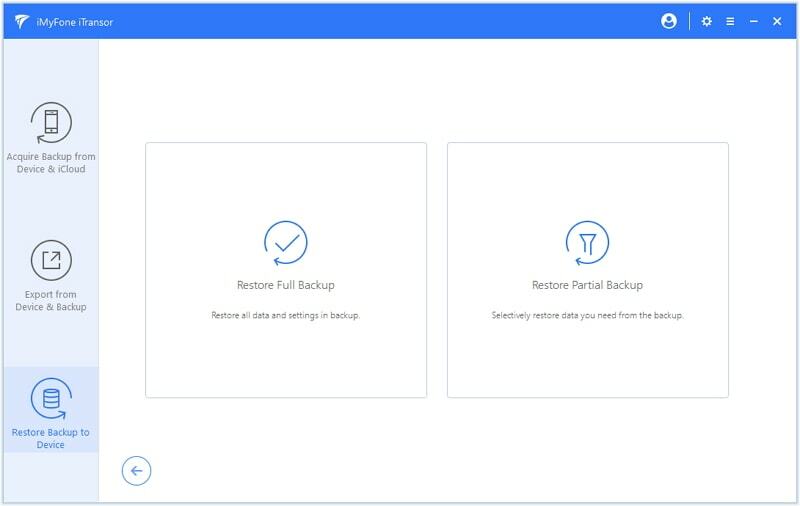 This is a great feature since sometimes you won’t need the full backup. Here we take Restore Partial Backup as example. 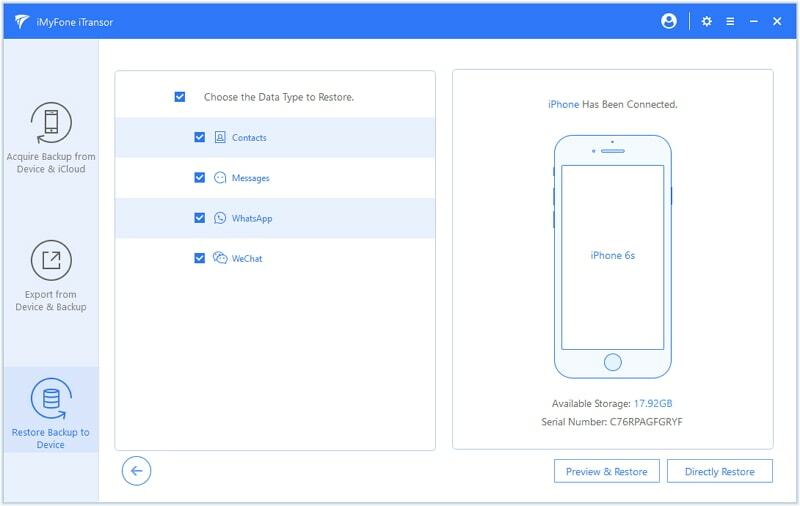 (3) You need to select the types of data you need to restore to your new iPhone. If you want to preview the data in the backup, just click "Preview & Restore". (4) After scanning, you can preview the data and confirm whether you want to restore it. If that's what you want to put on your new iPhone, click "Restore". (5) Choose from the options "Merge" and "Replace". Then the program will start to restore the data. If you choose "Merge", the WhatsApp data in the backup will be merged with the WhatsApp data on your new iPhone and no risk of data loss at all. If you choose "Replace", the WhatsApp data on your device will be replaced by the WhatsApp data in backup. While the above is how to selectively put iTunes backup on new iPhone, including iPhone X/iPhone. 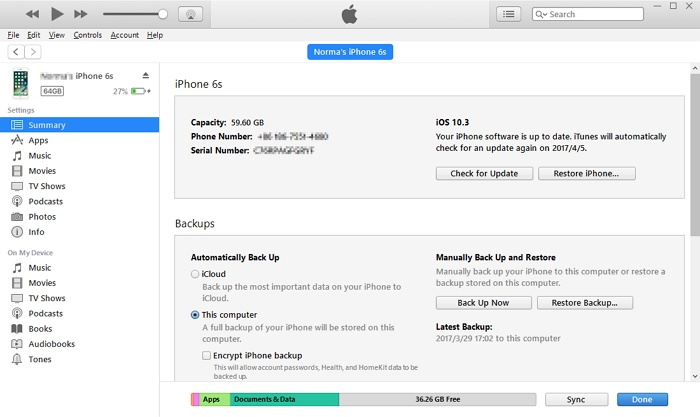 Users can also put iCloud backup on new iPhone using iMyFone iTransor. Instead of selecting iTunes backup file, they need to download and select the iCloud backup file via the software and then restore it with similar steps. The backups made for iOS 12 are also supported. The second method to put your old backup on new iPhone is to use Apple’s iCloud service. This method has its own limitations, but it will still do the job. 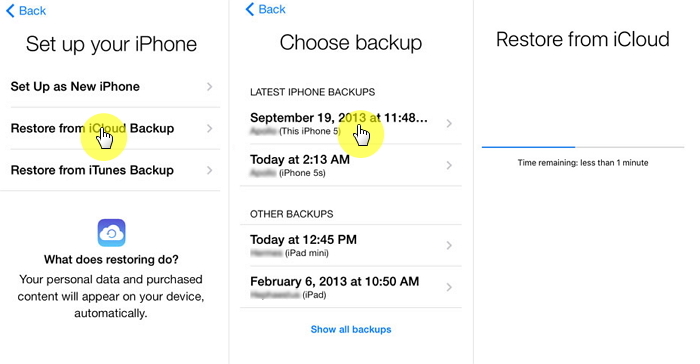 Follow the steps below to learn how to put iCloud backup on new iPhone. (1). Start your new iPhone. Follow the on-screen prompt and connect the Wi-Fi network. (2). Follow the steps until you see the Apps & Data screen. Choose Restore from iCloud Backup. (3). Fill in your iCloud account information and then choose an iCloud backup to restore. (4). Stay connected and wait for the restore process to finish, then complete the rest of the onscreen setup steps. (1). Connect your old iPhone to your Mac or Windows and open iTunes. (2). Go to summary and then go to the “Backups”. Click Restore Backup… and make sure you stay connected and the process is finished completely. (3). Choose the iTunes backup you need and wait for the process to finish. The time depends on how large is the backup. 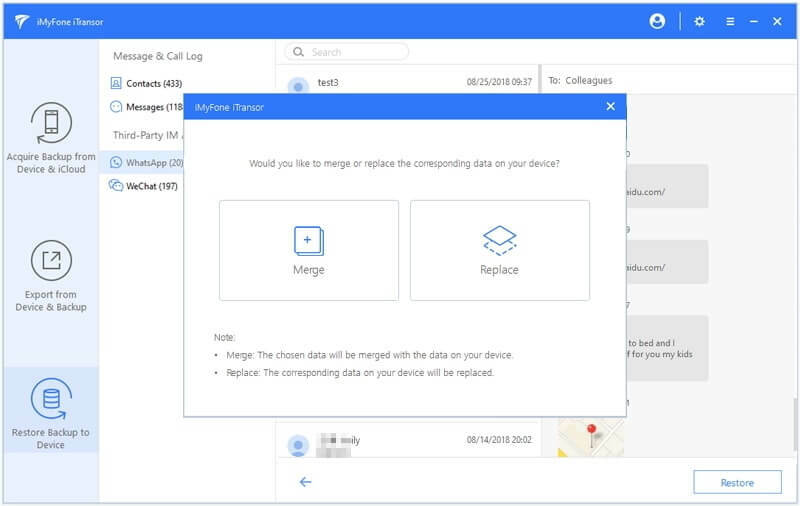 In the end, all methods have their own pros & cons, but iMyFone iTransor (compatible with iOS 12) offers a simpler and more versatile backup management and restore features. One thing is certain, following any of the methods here, you will be able to put your old backup on new iPhone, even you use iPhone X or iPhone 8. Besides, don’t forget to back up your new iPhone regularly with iTransor for free. How to Set Up New iPhone Xs/Xr/Xs Max from Backup?